So many of the Fall 2016 shows paid tribute to David Bowie. BCBG Max Azria not only used his music in the soundtrack, the collection reflected his performer's spirit in subtle style. 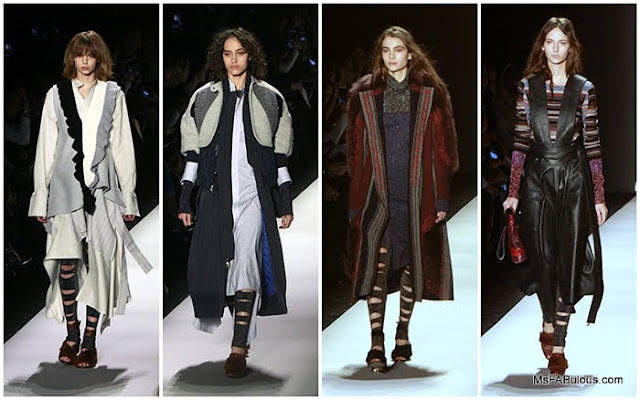 The layered textures and knits don't necessarily scream "Bowie". Underneath the outerwear, there are leotards, leggings, the skintight body conscious looks that the music and fashion icon turned to early in his career. There was some lurex sparkle mixed in like stardust and also for texture. The movement-friendly base pieces were also a nod to dancers and 1980s films like Flashdance. The rips in the leggings echoing Alex's ripped sweatshirt. I love the layered ensembles that combined multiple shades of complementary colors. Dark navy, eggplant, grays, wood browns transition right into my favorite autumn colors. Leather mixed with varigated stripes looked great on the runway. Calf-length, uneven hems, draped and easy was the dominant silhouette for the season. BCBG handbags and shoes have as many loyal fans as their clothing. Fall 2016 was about chunkier, clunkier footwear, like a contemporary update on 1970s clogs. They finally seem to have moved on from the envelope clutch and have softer, sleeker elongated clutch purses instead. BCBG from Max and Lubov Azria is not the most trendsetting label, but they are fashiom forward in a relatable way that makes their customers eager to hit their stores every season (as observed in my friends and colleagues). Happy shopping!